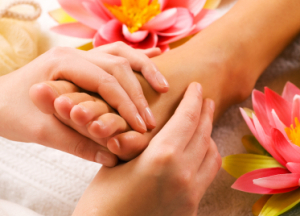 Show your feet some extra love and attention with these expert tips and homemade beauty treatments for pampering your feet. If your feet are dry and cracked from the weather, or just tired from a long day at work, give your feet a spa-like treatment at home by using these great tips! Christopher Watt, licensed aesthetician to many Hollywood stars, was kind enough to provide us some terrific advice for pampering and caring for your feet. Everyone loves to soak their feet, and a great feet treat is to fill a pan or bucket with warm water and place 1/2 cup of epsom salts in until dissolved. You can also float rose petals or add crushed lavender to the water. A few drops of peppermint oil is also a nice addition for increased circulation. Soak your pups in the water mixture and you’ll feel the tension begin to dissolve immediately. This would also be a good time to experiment with a blended honey and strawberry mask for the face. Grab a good book or magazine and you’re off to the start of a great date! Let your feet soak for 10 to 20 minutes and towel dry. Apply a good moisturizing lotion (preferably with peppermint) and massage the feet (or better yet have someone else do it for you) to increase circulation — or apply a honey, rosemary and peppermint treat for feet! Just blend approx 1/4 to 1/2 cup of honey, a sprig of fresh rosemary and a few drops of peppermint oil and apply to damp feet. Allow to absorb before applying slippers or clean socks (or better yet, crawl into bed or elevate your feet and legs while you finish that book or magazine article). If you have hard, dry feet, exfoliation is also key to softening the soles. Pumice stones are good as are rich granual exfoliants. One I like is Honey, raw sugar and grapeseed oil. Blend approx 1/4 cup honey with 1/4 cup raw or natural sugar and 2 tablespoons of grapeseed oil. Apply to clean feet and massage in generously, paying special attention to the heels and callouses. Wrap them in a warm moist towel and elevate feet for 10 to 15 minutes. Remove and apply moisturizer and clean cotton socks. In the morning, your feet will thank you!